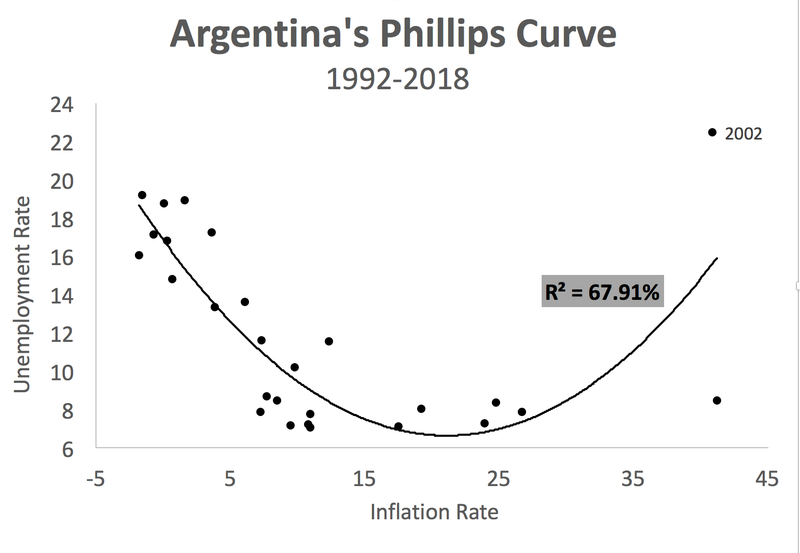 In the United States, there has been existential angst over Phillips curves for the past few years. Fed officials and other observers have been engaged in deep soul searching as they try to reconcile a falling unemployment rate with stubbornly low inflation. The Phillips curve says this development should not be happening--inflation should rise as the economy nears full employment. And yet, it has been happening for several years. [I]nflation targeting made inflation stickier than it used to be. Which means that inflation targeting became a victim of its own success. By making inflation sticky at 2%, it destroyed the very signal of deficient-demand recessions that monetary policy was supposed to respond to. The thermostat destroyed its own negative feedback mechanism. Minneapolis Fed President Neel Kashkari makes a similar argument in the Wall Street today. It is also the implication of this Cecchetti et al. (2017) paper that made a splash last year. This view makes the most sense to me. To be clear, I prefer thinking of inflation from a money supply-money demand framework along the lines of David Andolfatto and Josh Hendrickson. But if one is determined to approach inflation from a Phillips curve perspective, I see the thermostat view as the most convincing explanation for the breakdown in the U.S. Phillips curve relationship. Paul Krugman recently suggested we look elsewhere to get further insight on the Phillips curve. He turned to Spain which appears to show a strong Phillips curve relationship. This choice of country, however, is not a clean one since its monetary policy is set externally by the ECB. It is not obvious that we would see this relationship persist if Spain set its own monetary policy. Spain, in short, does not help us better understand the U.S. experience. One country that might be useful is Argentina, at least if we look at the non-hyperinflation years. It has its own central bank, the BCRA, and it has periods of instability that provide data not clouded by Milton Friemdman's thermostat. Interestingly, since 2010 the BCRA has tolerated double digit inflation in Argentina and currently inflation is running near 25 percent. This run of inflation has been above the central bank's inflation target of 8-12 percent so the BCRA conveniently changed its inflation target this year to 15 percent. It might interesting to see what this run of high inflation does to the Phillips curve. 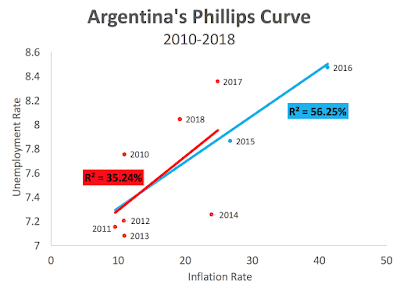 I plotted the Argentine Phillips curve below using annual data from the IMF WEO database and Focus Economics for this period of high inflation. Most of my data comes from the former source, but for the years 2015 and 2016 the IMF does not report the inflation rate presumably because of questions about the reliability of the data. Focus Economics does provide data for those missing years. The red line below shows the estimated Phillips curve relationship leaving out the questionable 2015 and 2016 observations while the blue line shows the relationship using all the all the observations. Yikes, we got an upward slopping Phillips curve! This is a small sample, but it is consistent with notion that inflation running too high can cause problems on the real side of the economy. We should dread this Phillips curve. 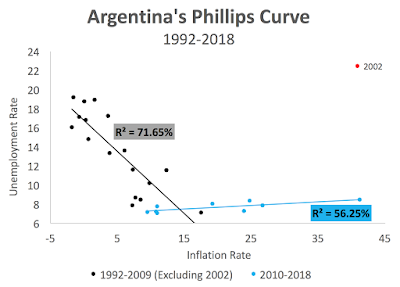 Now we see a more traditional-looking Phillips curve for the period 1992-2009 (excluding the 2002 outlier, the year Argentina broke the link with the dollar) of this sample. It is depicted by the black line. Most of the observations in this earlier period have inflation lower than 10 percent. That may explain why it looks more normal. For comparison, the 2010-2018 period is again highlighted by blue. If we plot a Phillips curve relationship over the entire sample we get the following figure. The takeaway, if there is any, from these Argentine figures is that a standard-looking Phillips curve may require inflation be less than 10 percent and there be periods of instability so that Milton Friedman's thermostat is not working. But if the thermostat is not working, then, the central bank is not doing its job. The Phillips curve, in other words, may never be very informative for places where central bankers are doing a great job anchoring inflation. The United States is arguably one such place. If that is the case, Fed officials might want to try a different approach to understanding inflation. 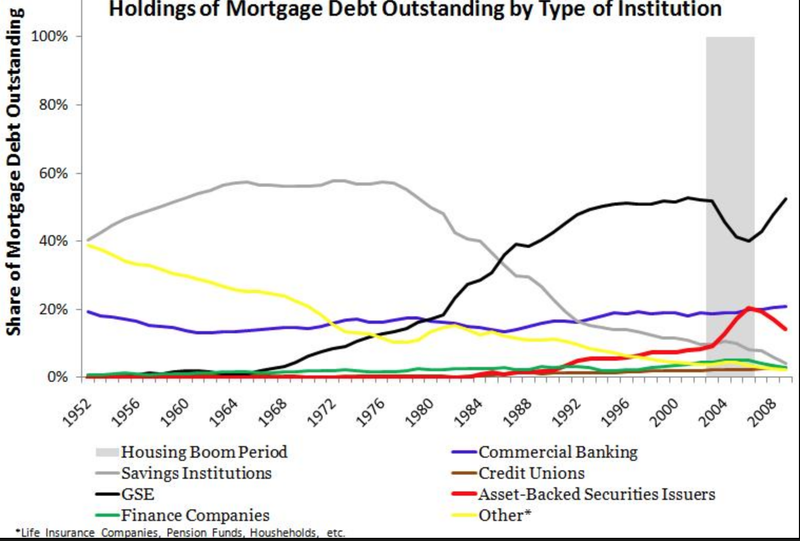 Consider first the historical share of mortgage debt outstanding by type of institution. This chart is actually mine from a few years ago. There are three key takeaways from it. First, the GSEs gain most of their market share in the wake of the S&L crisis. 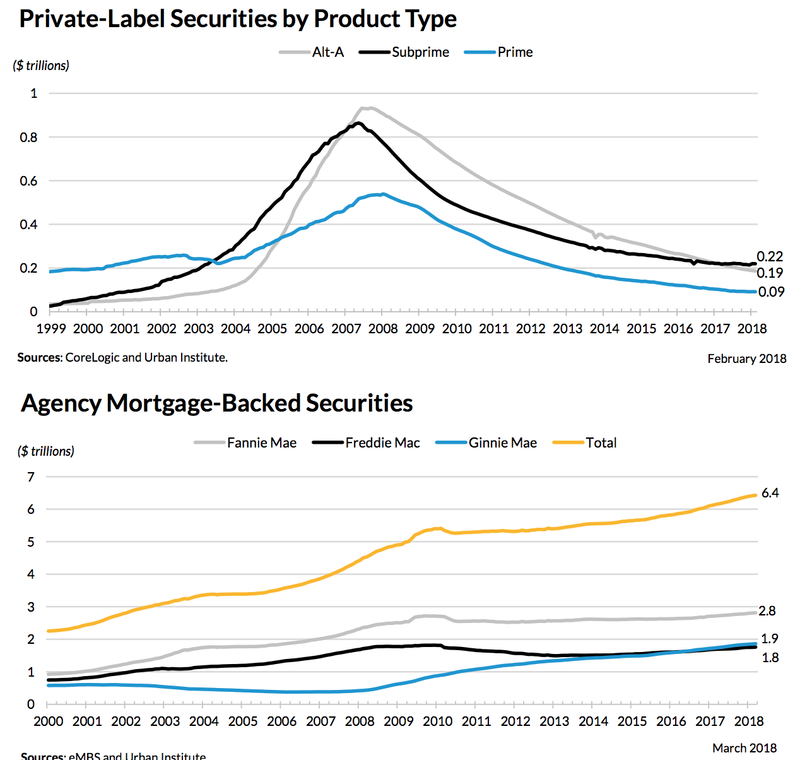 Second, the GSEs actually lose market share to the private label security (PLS) providers during the housing boom period. 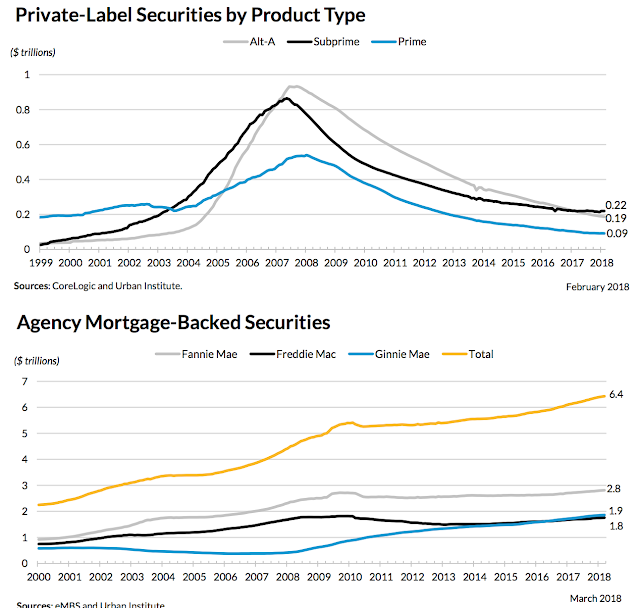 These PLS providers--the red line in the figure below--gained market share during this time by tapping into the Alt-A and subprime mortgage market. Eventually, the GSEs followed suit, but its was the private label security providers who went there first and did most of the damage. 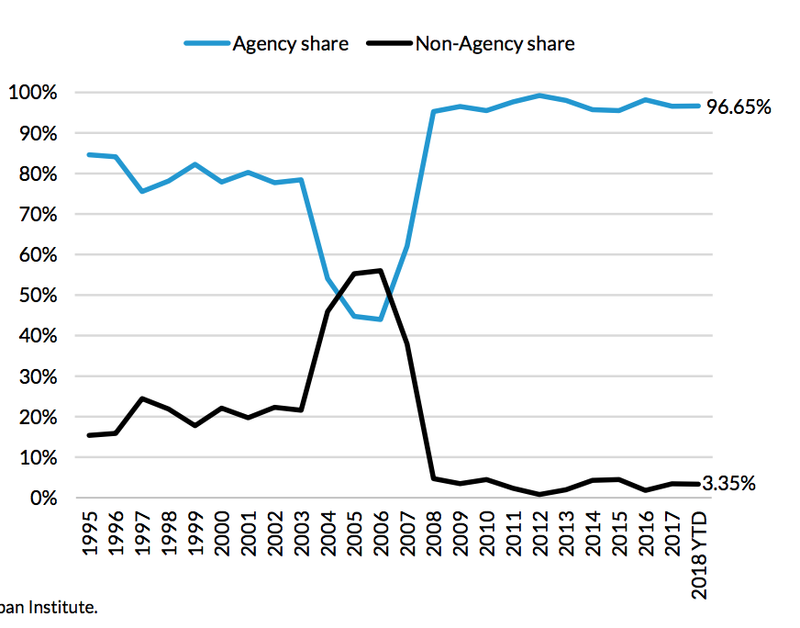 Third, the GSEs gain market share back as the PLS supply folded in the crisis. 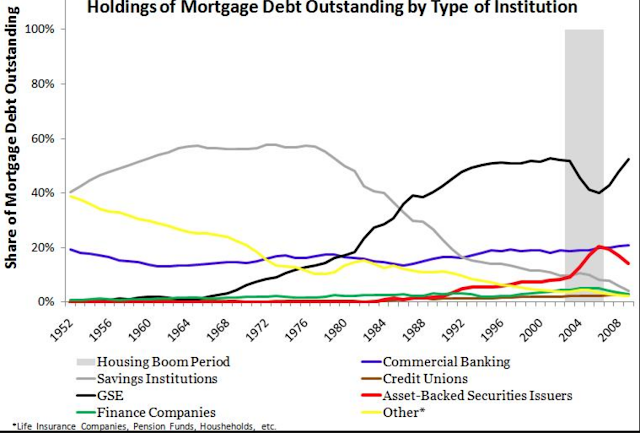 Next, if we look just at the share of securitized mortgages--which today makes up about 2/3 of all mortgages today--we see the dominance of the GSEs over PLS today. This can be seen in the figure below from the Urban Institute report. Finally, for those curious, the Urban Institute has a nice chart summarizing the total value and equity of the U.S. housing market. This chart reports that the U.S. housing equity turned positive again in 2013 and currently stands at $15.2 trillion compared to household debt level of $10.6 trillion. Happy days are here again for U.S. housing. Again, these charts are just a small part of my conversation with Nick. It should be out in a month or so. In the meantime check out the entire Urban Institute report.